Sometimes it is required to engage a load after the driving member attained a particular speed. In that condition, the centrifugal clutch is used. This clutch is helpful with an engine that has trouble starting under load. They are usually used in motor pulleys. 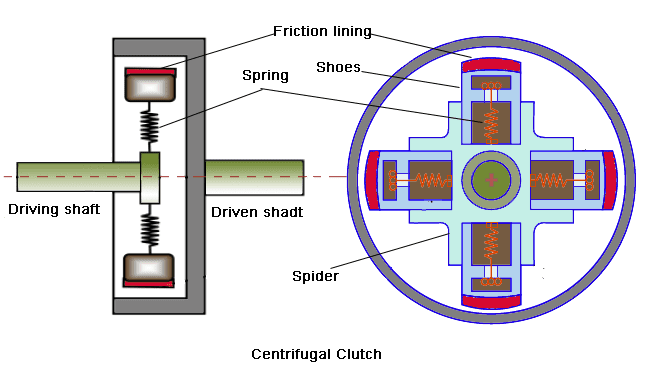 The centrifugal clutch consists of a number of shoes or friction pads arranged radially symmetrical position inside the rim. It can slide along the guides integral with the boss on the driving shaft. The shoes are held against boss by using a spring that exerts a radially inward force. 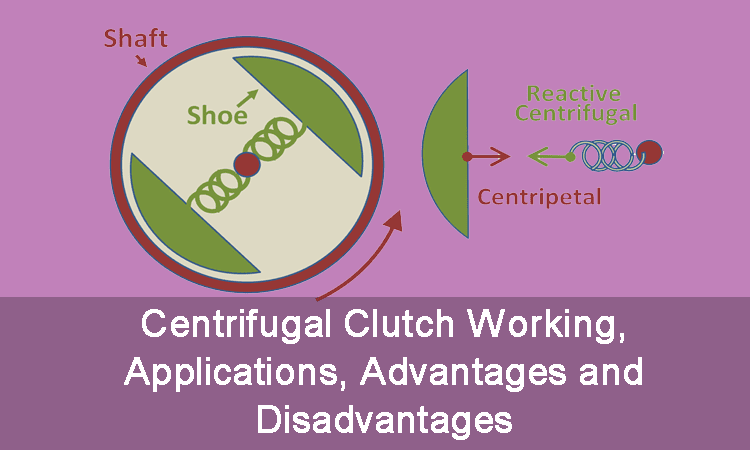 As the inner hub rotates, the weight of the shoe causes a radially outward force known as centrifugal force. This force depends on the weight of the shoe and the speed at which it rotates. At low speed, the centrifugal force also low, the shoes remain in the same position. As speed increases, the centrifugal force also increases, when centrifugal force becomes equal to spring force the shoes start floating. When the driver rotates fast enough the centrifugal force exceeds the spring force the shoes moves outward. At a certain speed, it gets contact with the inner surface of the drum and torque is transmitted. As the load increases, speed decreases; the shoes return to their original position and clutch gets disengaged. Centrifugal clutch found application in the chain saw, lawn mower. The centrifugal clutch engages after a particular speed limit, so they used to disengage the engine when starting and idling. Simple and inexpensive and need little maintenance. The centrifugal clutch is automatic any kind of control mechanism is not necessary. They help to prevent the engine from stalling. The engagement speed can precisely control by selecting spring. Loss of power due to friction and slipping. This type of clutch not appropriate for the high amount of torque, the shoes will slip at the heavy loaded condition. They engage at full or near-full power, shoes get heated very quickly may cause overheating.